I believe that food is a connector. Both to the people we love and to our heritage. I began writing about Scandinavian food in 2009 a couple of months after Grandma Agny passed away; the grief had struck me in ways deeper than I could have expected, and I found myself seeking out elements of our shared Norwegian heritage as a way to feel closer to her memory. Food was the winner. As I read Beatrice Ojakangas’ The Great Scandinavian Baking Book and Marcus Samuelsson’s Aquavit–the two titles that began my collection of Scandinavian cookbooks–I began to understand my grandmother and our Norwegian heritage in new, illuminating ways. Outside Oslo became a place where I could share what was on my mind and what I was discovering as I cooked and baked my way through Scandinavian recipes. Earlier this week I had the privilege of speaking at a Daughters of Norway meeting in Seattle about how we can use food to share our heritage with people we care about–both in the present and as we think about ways to preserve it for the future. Whey they invited me to come and speak at their May meeting, I was both honored and nervous. I would be speaking to women who knew just as much–perhaps more–about the cuisine than I do, and I wanted to both inform and inspire them. What it came down to was speaking from the heart. On that special evening, I shared how I became interested in Norwegian cuisine, and the important roles it has played in my life from childhood and into the present. I discussed the value of creating memories with loved ones, sharing stories and family history, and handing down recipes and the associations that go along with them. Speaking from my own experience, I shared ways to preserve family history and recipes through tools such as blogging and making a family cookbook. As I bake regularly with Grandma Adeline and my mom, we create memories as we spend time together in the kitchen, sampling bites of whatever we’re making and often enjoying a meal. In these baking sessions, something often triggers memories for Grandma, and she’ll share stories from her youth in North Dakota, her experiences cooking for and managing restaurants, and bits of family history. These baking days bring forth parts of my family history and my heritage that I might otherwise never have learned. As I did with the women of Daughters of Norway, I would like to encourage you to find ways to share such experiences with your relatives, whether they’re older generations or younger. Food has an amazing way of connecting people, and so much of a time and place can be wrapped up in one single recipe. If you do decide to write a family cookbook, let me share with you one of the recommendations a source gave me when I interviewed her for an article on the topic for Costco Connection magazine: Don’t worry about including the most impressive recipes. The goal, rather, should be including the ones with meaning, the ones that have fond memories and stories written between the lines. For me, one of those recipes is for Norwegian waffles. I suspect every Norwegian family has its own version of this traditional dish; some use sour cream, others use buttermilk. Some people eat them with lingonberry preserves, others with geitost (brown goat cheese) or some sort of nut spread. 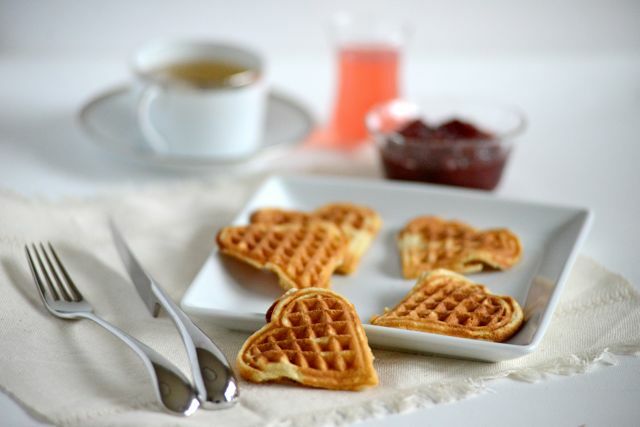 But they’re typically made with a waffle iron that creates little heart-shaped waffles that look pretty on a platter and speak to the love that invariably goes into making them. This particular recipe goes back generations, at least to my great-grandmother Josephine. Making them with Grandma Adeline a week and a half ago, we carried on a family tradition, imbuing generations of past memories with our own and connecting the past with the present. And that, my friends, is a very special gift. Cream butter and sugar in a large mixing bowl. Beat eggs in a separate bowl, then add to the butter and beat until smooth. Mix in buttermilk and milk. Sift together flour, baking powder, and baking soda and mix into the batter to combine. 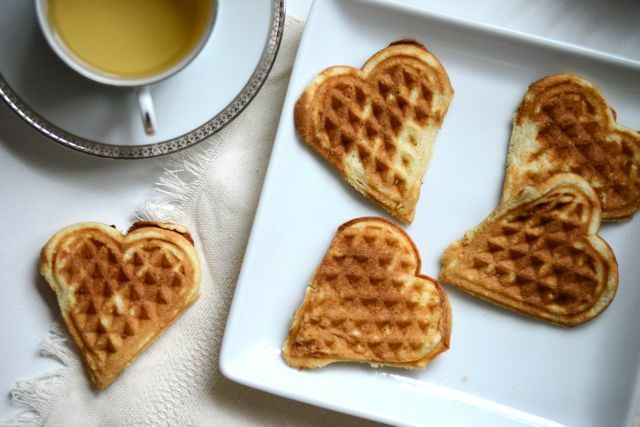 Baking using a heart-shaped waffle maker. I make Norwegian waffles often. It’s a favorite of my Norwegian American family. The one difference I notice from your great grandmother’s recipe is that there’s no cardamom. Do you use that spice in your waffles? Otherwise, it’s very similar to mine. 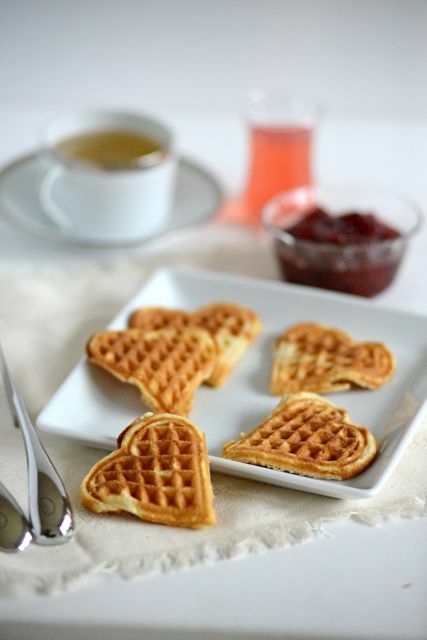 And of course, I always use my heart shaped waffle iron. Debbie, aren’t they great? We don’t use cardamom in the batter, but that sounds amazing! In the belgian waffles from my garndma, she did use a lot of buttermilk also in her tasty waffles! I must make your tasty waffles recipe soon! Yummmm! Please do! And let me know how they turn out! Ah, waffles in Norway are definitely “sacred” family food. At work we even get served waffles once a week. I loved this post, I definitely want to create traditions and memories through food and cooking for my daughter. Satu, I hope you do! These memories are priceless. 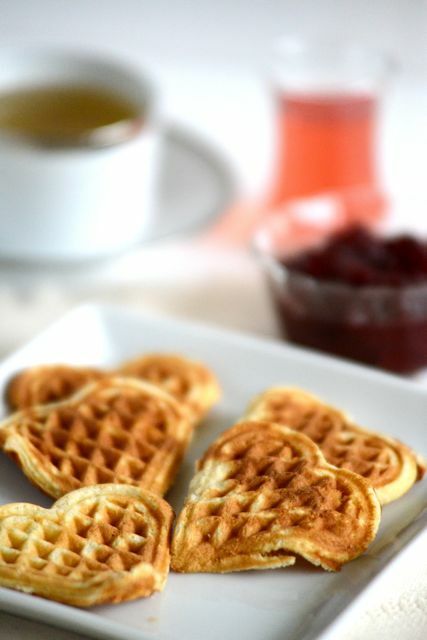 I’ll bet these are very tasty, but I have to agree with Debbie in the first comment: To me, they are just not Norwegian waffles without cardamom. Just the smell of that spice instantly transports me to Norway. Please do try it in your waffles at least once! Debbie – Thanks for commenting. Isn’t the smell of cardamom one of the most comforting and nostalgic scents? I have plans to make the waffles again in the coming weeks and I will be sure to add some cardamom! I learned about Norwegian waffles from the mother of my exchange student. Marian would make them in the afternoons for a little sweet treat with coffee. She would cut them into individual hearts and we would spread on strawberry jam. So I got heart shaped waffle maker for Christmas and made them this morning. This recipe is perfect. They were a hit! I am going to try them with cardamom next. Thank you! A fine recipe but as a Norwegian I would ad both cardamom and Scandinavian vanilla sugar. Hi I Live in Jonestown PA , from Brooklyn NY ! I was Wondering where I could Buy a Norwegian Waffle maker ? Hi Susan, my father was from Kristiansand as well. The best waffle iron to buy here in America is the Chef’s Choice 840 Traditional Five of Hearts. When you get it, use the “crisp exterior/moist interior” setting. in my experience it is the most reliable and fastest iron.